Physicists like to study seemingly unrelated phenomena to show that a relationship can be found if they are examined closely enough. This search for unification has been going on for centuries. In 1665, the 23-year-old Isaac Newton made a basic contribution to physics when he showed that the force that holds the Moon in its orbit is the same force that makes an apple fall. We take this so much for granted now that it is not easy for us to comprehend the ancient belief that the motions of earthbound bodies and heavenly bodies were different in kind and were governed by different laws. 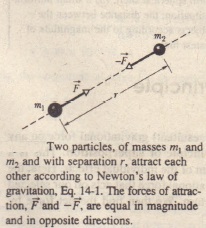 The strength of the gravitational force- that is, how strongly two particles with given masses at a’ given separation attract each other-depends on the value of the gravitational constant G.If G-by some miracle-were suddenly multiplied by a factor of 10, you would be crushed to the floor by Earth’s attraction. If G were divided by this factor, Earth’s attraction would be weak enough that you could jump over a building. Although Newton’s law of gravitation applies strictly to particles, we can also apply it to real objects as long as the sizes of the objects are small compared to the distance between them. The Moon and Earth are far enough apart so that, to a good approximation, we can treat them both as particles-but what about an apple and Earth? From the point of view of the apple, the broad and level Earth, stretching out to the horizon beneath the apple, certainly does not look like a particle. Newton solved the apple-Earth problem by proving an important theorem called the shell theorem. Earth can be thought of as a nest of such shells, one within another, and each attracting a particle outside Earth’s surface as if the mass of that shell were at the center of the shell. Thus, from the apple’s point of view, Earth does behave like a particle, one that is located at the center of Earth and has a mass equal to that of Earth. Suppose, as in that Earth pulls down on an apple with a force of magnitude 0.80 N. The apple must then pull up on Earth with a force of magnitude 0.80 N, which we take to act at the center of Earth. 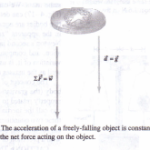 Although the forces are matched in magnitude, they produce different accelerations when the apple is released. For the apple, the acceleration is about 9.8 m/s2, the familiar acceleration of a falling body near Earth’s surface. For Earth, the acceleration measured in a reference frame attached to the center of mass of the apple- Earth system is only about I X 1O-2s m/s2. 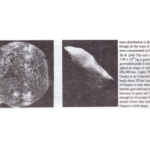 m: (I) a large uniform solid sphere, (2) a large uniform spherical shell, (3) a small uniform solid sphere. and (4) a small uniform shell. In each situation. the distance between the particle and the center of the object .